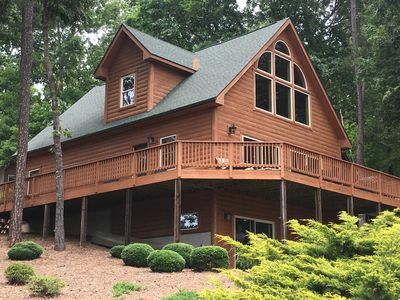 You can truly relax in this exceptional 5,000 square foot home, 1 mile from the main highway in Seneca, and only 7 miles from Clemson, opposite game day traffic. 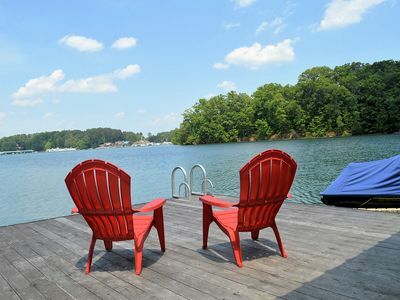 Enjoy this pristine lake by renting a boat from the Lake Keowee Marina which is within walking distance, or for a slower pace, you can kayak to one of many islands. A CANOE AND 3 KAYAKS ARE PROVIDED. Pack light! 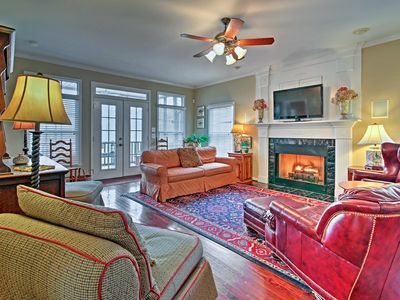 This home is very well equipped for families, including toys, games, beach towels, coolers, etc. 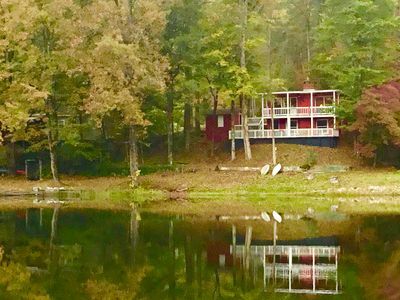 Stunning water and mountain views can be seen from any of the 3 large decks (each with a grill), the screened-in porch next to the sandbox, or from the all-glass dining room with gourmet kitchen. Wireless internet is accessible anywhere in the house. There are 8 TVs with cable, and some DVD players, and ceiling fans throughout the house, as well as outside. Enjoy the natural beach with fire pit and kayaks. An outdoor shower makes for easy clean-up after the sandbox or beach. We have one high chair, and a Pack-and Play stored in the laundry room. Please note that the house is child-friendly but not baby-proof. Our very large gourmet kitchen with central island, 2 microwaves, and double oven is well stocked. The dining room seats 10, and overlooks the lake. The nearby breakfast bar seats 5. 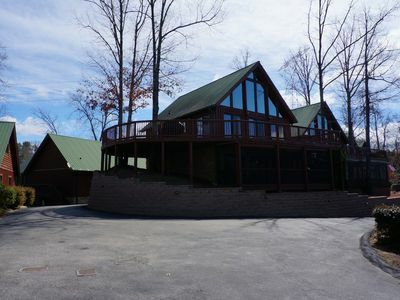 The huge 2 story great room has a stacked stone fireplace, TV, and stereo. The wall facing the lake is all glass. 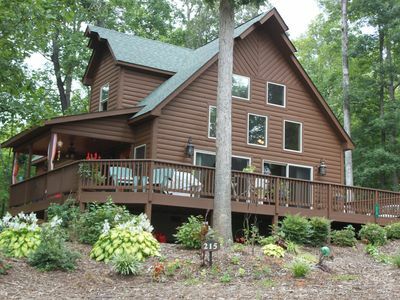 The spacious master suite has an attached sitting room which also overlooks the lake and opens out to the deck. The laundry room is large, with plenty of counter space, and a sink. Laundry supplies are provided for your use. 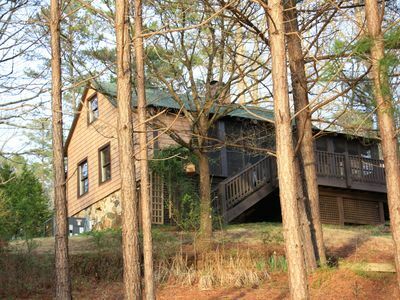 Upstairs there is a second suite with a king bed as well as an additional single, and full private bath, IDEAL FOR ANOTHER COUPLE OR A SECOND FAMILY. Also on this level are 2 additional bedrooms which share a full Jack & Jill bath. 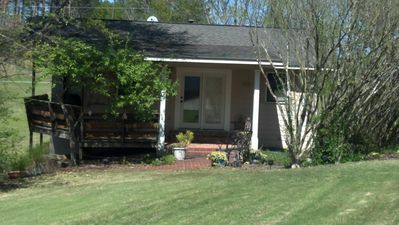 The king suite and the other two bedrooms are on opposite ends of the house, divided by a bridge walkway. 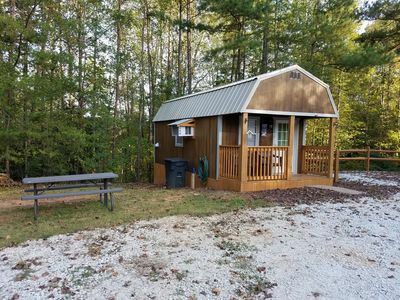 Each bedroom has a ceiling fan and flat panel TV with DVD player. 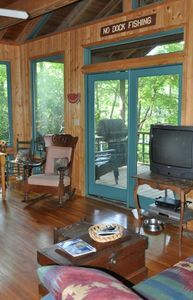 The lower level walks out onto a covered deck and a screened porch, both with lights and ceiling fans. 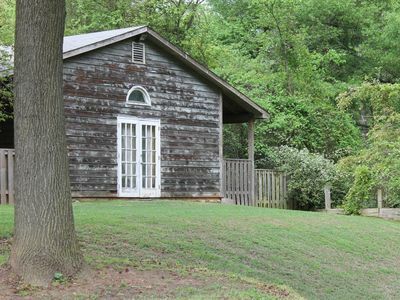 The sand box is adjacent to the screened porch, so small children can be watched from under a fan. There is a gas grill in the screened porch. Meals in the porch are easy with a second kitchen just inside on this level. A bar that seats 5 is adjacent to the kitchen. The game room has children's shuffle board and numerous toys for small children. 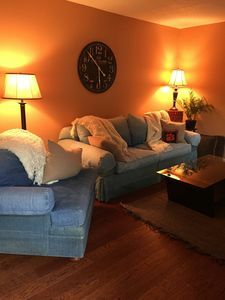 A full size sleeper sofa is also in this room. In a separate room is a TV with cable, DVD and VCR. A full bath is also on this level. 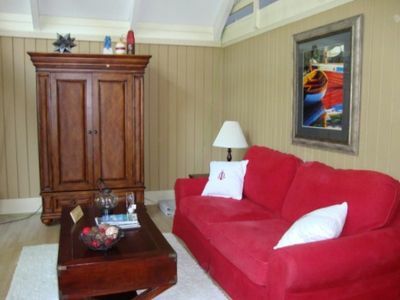 In addition to a sofa, there are blow-up beds with linens to accommodate additional guests. 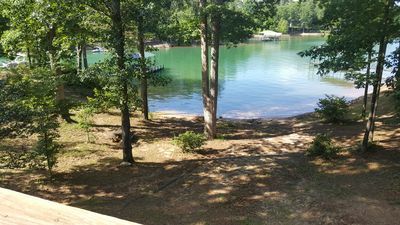 There is a large deck made of Ironwood with plenty of seating along the water's edge, as well as a walkway between the natural sandy beach with fire pit, and the floating dock which has a covered section with table and chairs, small refrigerator, ceiling fan, and deep water. There are kayaks and life jackets available for your use. The upper-most deck off the great room and dining room has additional seating as well as a gas grill for meals inside or out. The view of the water and mountains is beautiful! 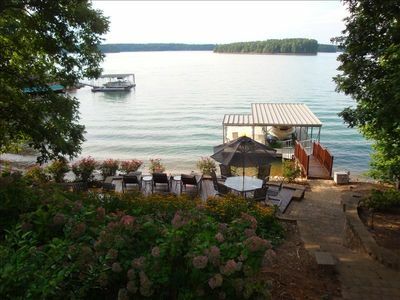 Unlike other lakes in our area, Lake Keowee's water levels are maintained year round, even at the expense of the lakes both upstream and down, if necessary. The marina has a launch if you should choose to bring your own boat, and there is plenty of room to park a trailer at the bottom of the lower driveway at the house. Also nearby is a full service grocery store (with Starbuck's inside) and two pharmacies, each approximately 1.5 miles away. There are several restaurants and multiple fast-food choices within 5 miles, and the hospital is approximately 4 miles away. PLEASE NOTE THAT OUR HOUSE IS ON A QUIET RESIDENTIAL STREET, AND OUR NEIGHBORS ARE NOT NECESSARILY IN VACATION MODE. THEREFORE, PLEASE UNDERSTAND THAT OUR HOUSE IS NOT SUITABLE FOR LOUD NOISE OR PARTIES, AND IS INTENDED TO BE FOR THE USE OF ADULTS AND FAMILIES RESPECTFUL OF OTHERS NEARBY. PARKING IS LIMITED TO A MAXIMUM OF 4 VEHICLES. LASTLY, PLEASE NOTE THAT WHILE FAMILIES WITH CHILDREN ARE OF COURSE WELCOME, THE FINANCIALLY RESPONSIBLE PARTY SIGNING THE RENTAL AGREEMENT MUST BE AT LEAST 35 YEARS OLD, AND MUST BE AN OCCUPANT OF THE HOUSE DURING THE TERM OF THE AGREEMENT. 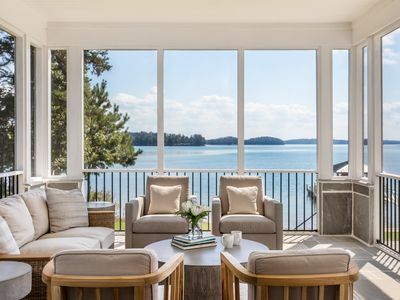 RENTING ON BEHALF OF GUESTS LESS THAN 35 YEARS OLD IS STRICTLY PROHIBITED. 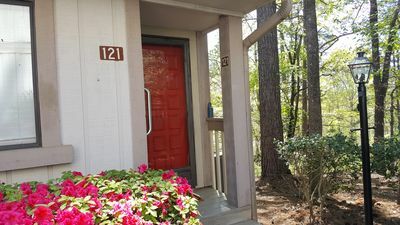 3 Bedroom Townhouse - minutes from FOOTBALL!!! 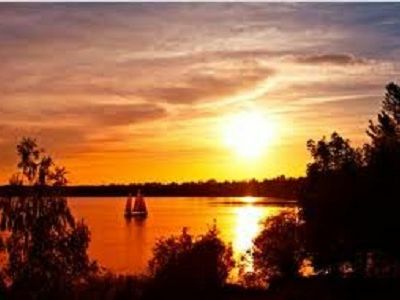 Great alternative to area hotels! 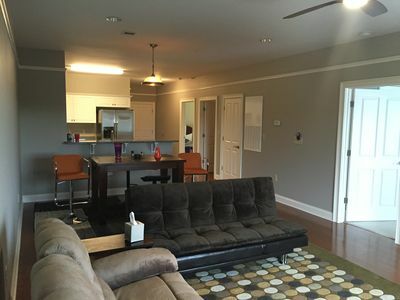 Clemson Downtown Top-floor Executive Condo (Walk To Campus/Games)!!! 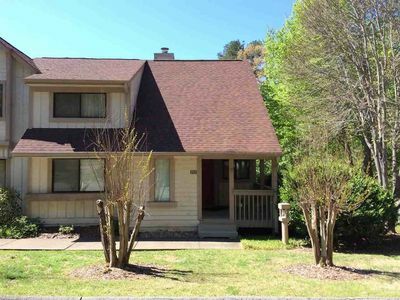 Comfy, Cozy townhome perfect for Clemson football rental on Keowee Key!